Register For The March Student Blogging Challenge! Imagine your students running into the classroom to check which international visitors have left a comment on their blog. Imagine your students putting in more effort than ever before because they know their work will have a global audience. Imagine your students learning about publishing online without relying on you as the expert. For the last 10+ years, these are the sorts of comments we’ve heard from teachers who have taken part in the Student Blogging Challenge. Now it’s your turn to sign up! The Student Blogging Challenge is a way for students to learn about publishing online while making global connections. The 22nd Student Blogging Challenge beings on March 3, 2019. Registrations are now open! This experience is totally free and open to all. I’ll be leading the challenge and have made a short video with insights from past participants to give you an overview of what the challenge is all about. Take a look and please share it with others who might be interested. Thank you to the students who featured in the video from California (USA), Performance Learning Program at Seycove (Canada), British International School Belgrade (Serbia). Interested? You can follow the steps below to register or scroll down if you want to read more about the challenge before registering. If you haven’t already, sign up for our Student Blogging Challenge mailing list to stay in the loop! This isn’t a registration form but you’ll want to be on the mailing list to keep up to date with all the challenge news. This means teachers and students participate together and students don’t need to have their own blog (although they can). Student work will be published on the class blog as a post or series of posts. Or the teacher might publish a post and invite the students to comment. 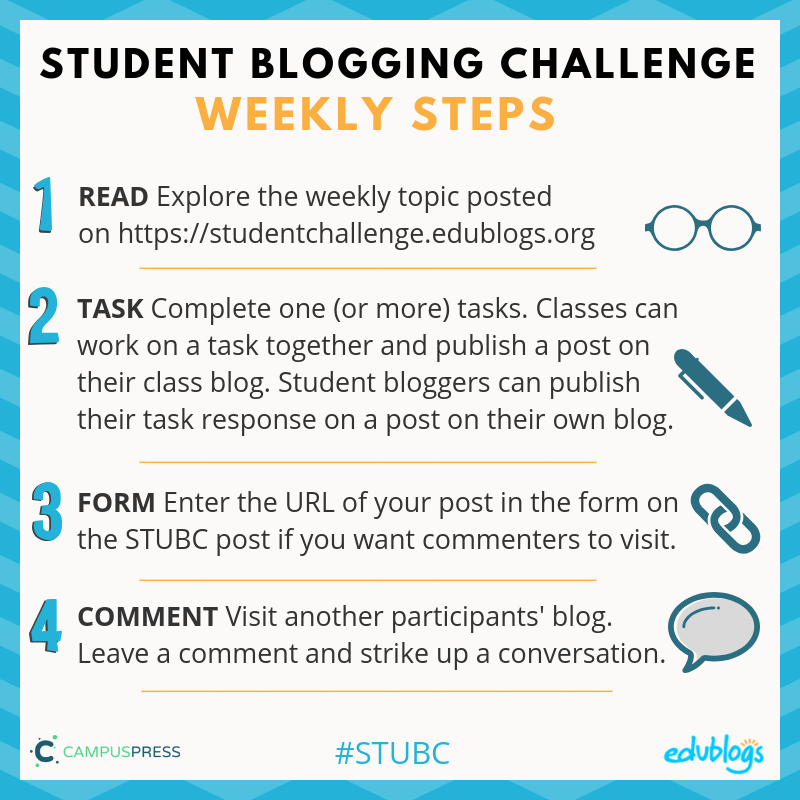 Students with their own blogs can take part by publishing posts in response to the weekly challenges on the Student Blogging Challenge blog. They can also comment on other students’ posts. Commenters need to be approved by our commenting team leader, Sue Wyatt. They need to be involved in some field of education — e.g. teaching, working with children, studying education, retired teachers etc. If you know someone who might like to volunteer, please ask them to consider registering and joining our mailing list! Commenters are asked to visit five blogs per week and you can make a big difference in the lives of young people by just dedicating one hour a week for 10 weeks! While participants will learn about blogging through the challenge, it can be very helpful to start setting up your blog before the challenge begins. Student Blogging Bootcamp (for students) — This course guides students through the process of setting up and using their own blog. Some teachers like to assign all/parts of the bootcamp to their students before the challenge begins. Blogging With Students Teacher Challenge (for teachers) — We walk you step-by-step through the process of setting up a class blog and blogging with students. You can also sign up to complete this challenge over 30 days if you wish. I’ve Registered As A Participant. Now What? Fantastic! Perhaps you’d like to add the challenge badge to your sidebar or About page? Every week on a Sunday (starting March 3), I’ll publish a new post on the Student Blogging Challenge website. If you’re subscribed to the email list, you’ll get a reminder about this via email. Otherwise, you can just check the Student Blogging Challenge site when it suits. Read: Teachers can read through the post that’s on the Student Blogging Challenge site with their class, or assign the post to their students to read. Alternately, teachers can summarize the information on their class blog. Task: Students will complete one (or more) task and publish it on their individual blog or class blog. Form: Participants need to enter the URL of their blog post in the Google Form that will be at the bottom of each weekly post. Connect: The last step involves visiting other participants’ blogs. Leave a comment and strike up a conversation. If you can’t complete a task every week, that’s fine. You’re also welcome to adapt tasks to best meet the needs of your class. I’ve Registered As A Commenter. Now What? Our commenting team leader, Sue Wyatt, will contact you to let you know if you’ve been accepted as commenter via the email or Twitter handle you provided. She’ll also email in the lead up to the challenge explaining the process if you’ve been accepted. Sue will support you as a commenter throughout the challenge. She’ll send you weekly emails with instructions and tips, and you’ll be able to contact her to ask further questions. There’s also a badge for commenters that you might like to display on your own site if you have one. Read more about volunteering as a commenter in this post. 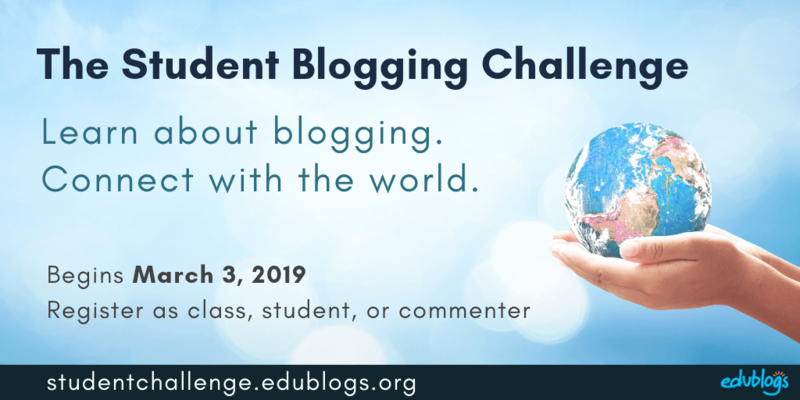 The Student Blogging Challenge is about embracing all of the benefits of blogging — from learning digital writing skills, and digital citizenship, to developing an authentic audience and connecting with others around the globe. 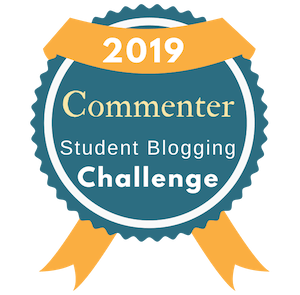 The challenge is made up of a series of 10 weekly tasks all designed to improve blogging and commenting skills while connecting students with a global audience. The challenge is totally free and open to students or classes from all over the world. While we’ve had participants from K-12 take part, the tasks are ideal for students around the ages of 8-16. While Edublogs supports the challenge, you don’t have to be using Edublogs to take part. You will just need to alter the ‘how-tos’ we share throughout the challenge to match your own blogging platform. Our detailed instructions will usually refer to Edublogs or CampusPress blogs. There’s a lot to be gained from joining the challenge! Of course, students and teachers will learn how to blog and there are SO many benefits of blogging. You never know what sort of learning can take place when you start building connections and finding an authentic audience for students’ work. There is a lot of power in amplifying learning! The more you put in the more you will get out and many participants have found they’ve gained the most when they’ve spent time on building relationships with other classes taking part. Participants are strongly encouraged to read posts from other students/classes and leaving comments that include questions. Connections can span long after the challenge ends. Students who join the challenge will have access to a badge for their blog and certificate too! There will be a different topic each week and a new post will be published on the Student Blogging Challenge site every Sunday. Some topics will be blog skills — like commenting (the first few weeks will focus mainly on essential blogging skills). Some topics will be important digital literacy skills like images and copyright. Other topics focus on developing global understandings — like learning about holidays and celebrations. Some topics will focus on fun and creativity too. After reading through some information and examples, you’ll be presented with a number of options for tasks to complete. The task might be writing a blog post or page, trying out a free online tool, trying an online activity, completing some research, or visiting other blogs and leaving comments. Do I Have To Participate Every Week? No! You can pick and choose what suits you and your students. Some weeks you might spend a lot of time on a topic. Perhaps opting to complete more than one task. Other weeks you might be busy or the topic might not suit your class, so you can simply skip it. You also have the option to modify anything to suit the needs of your students. If you need to start late or you have holidays that fall during the ten weeks (March 3 to mid-May), that’s not a problem. We’ve created a PDF document of Frequently Asked Questions. Click here to save a copy to your computer. Anything else you’re not sure about? Leave a comment and I’ll get back to you! Alternatively, you can send me an email via this contact form. Umm.. is this a school thing because I do not go here and I really want to continue with Edublogs but I think it is for school only. Although I will not be formally registering, I might participate on my own for the fun of it.